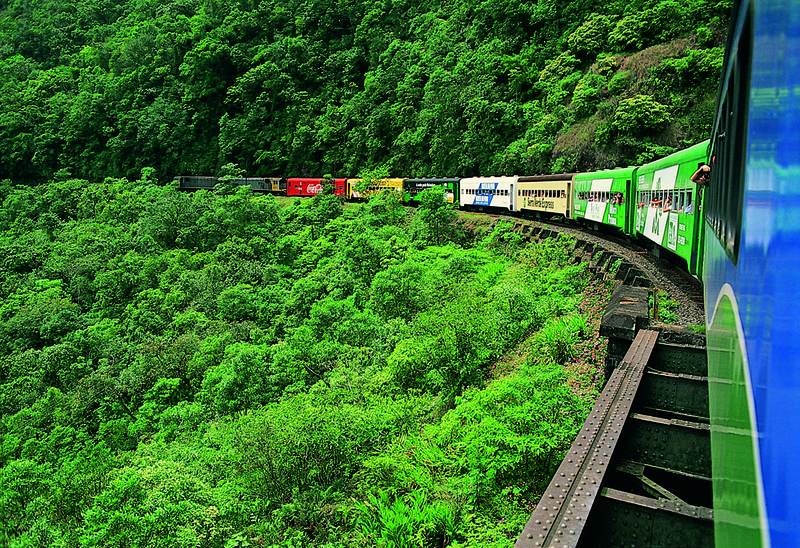 The exciting train tour from Curitiba to Morretes crosses the Atlantic rainforest most preserved area in Brazil. Gorgeous! The train tour from Curitiba to Morretes and Paranaguá that crosses the Serra do Mar is a great tour option for you in the great brazilian state of Paraná, southern Brazil. Once visiting Paraná, you cannot leave without taking this traditional, famous and breathtaking Train Tour from Curitiba to Morretes or Train Tour from Curitiba to Paranagua. 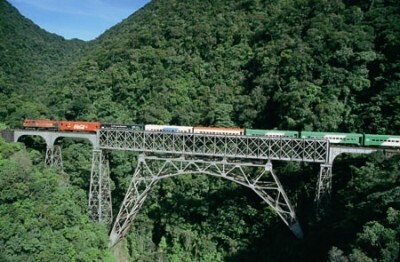 The train leaves Curitiba, crosses Serra do Mar (the most preserved area of the brazilian Atlantic rainforest) and ends at the historical cities of Morretes or Paranagua (departures to Paranaguá only on Sundays). The train tour from Curitiba to Morretes or Paranaguá lasts about 3-4 hours and among its 110 kilomeeters of railway line extension you get to see amazing landscapes, rich animal and vegetation biodiversity, spectacular bends, canyons and gorges, waterfalls and a lot more. Also, during the trip the train passes trough 14 tunnels, 30 bridges, beyond mountains and viaducts. Prominence for the Viaduto do Carvalho, suspended on five masonry pillars in the hillside of the rock, getting the sensation to be flying. Véu da Noiva, a 70 meters waterfall from Rio Ipiranga is another amazing sightseeing. Getting out in Morretes you may be received by the women association of the city selling products made of bananas and ginger (typical Morretes fruit and root) like candies, cookies, cachaças or pingas, natural flavored chips, etc. Very yummy!!! Barreado, typical dish of Paraná! After the tour, you can stroll and visit other tourist attractions in the historical cities of Morretes and Paranagua. Eating the delicious Barreado for lunch is also a must do! Barreado, a typical dish of the Paraná State, Brazil, is a slow-cooked meat stew prepared in a clay pot whose lid is sealed with a sort of clay made from wheat or cassava flour, hence the name (which means, literally, “muddied”). 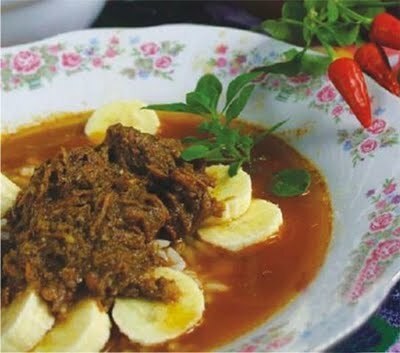 For more information read the post “Barreado: The Famous Typical Dish of Paraná State!”. The train has different wagons categories and each class has a different fare. Litorina: DOES NOT OPERATE IN PARANÁ ANYMORE!!! Litorina Luxo: Departures only on weekends and holidays at 9h15; Leather and velvet couches/sofas; bar inside the car; 1st class catering; landscape live transmission in LCD screen; 1st luxury train in Brazil. More than 100.000 people embark per year in this exciting adventure. The train departure from the Railway Station of Curitiba (Address: Avenida Presidente Afonso Camargo, 330). If you need any assistance and want to make arrangements for your trip with a local incoming/receptive travel agency, we suggest you to contact: Special Paraná Turismo & Eventos – www.specialparana.com – (41)3232-1314 (Portuguese, English, German, Spanish and French spoken). Please, share your experiences in this your with us! We love to hear the feedback and also, your information and opinion about the tour is very precious for us and other travellers. Thank you very much!! !